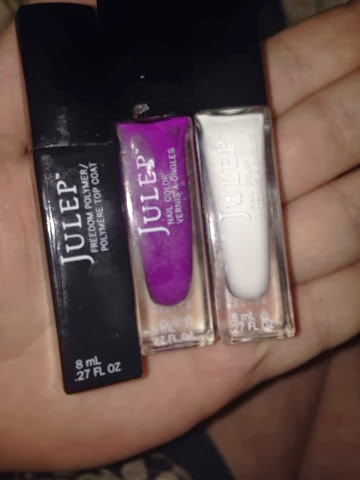 So in this previous post I showed that I won a great prize from julep. It took some time to get to try the polish as I have been busy. I loved the assortment of colors and when I picked a color I didn't know what to pick. I had my boyfriend pick and he picked purple. I wanted some thing different so I picked white to go on one finger. So the first swipe seemed like it was more wet and thin then the opi nail polish I have, I was kinda disappointed that it didn't seem very pigmented. I had to put 3 coats on for it to be bold enough for my liking. Paired with the top coat I got it gave it a nice glossy look . I would rate this first time using julep 6 out of 10. Colors used are Bette, Nicolette and freedom polymer coat.